Preheat oven to 375 degrees F. Have your pan ready to go - either a 16-inch round cake pan or a 10x13-inch lasagna dish. The phyllo should be room temperature or slightly cooler. Open the package right before using it so the sheets do not dry out. Stir the milk, semolina, ½ cup of the sugar, the butter, and vanilla in a large sauce pan over medium heat. Stir the mixture gently but constantly until it becomes thick like pudding. This may take up to 15 minutes or so. Remove the pan from the heat and cool for 5 to 10 minutes. Beat the eggs with the remaining ¼ cup of granulated sugar in a small bowl and then stir it into milk mixture. Stir in the orange zest. Melt the butter and begin by brushing the the bottom of your pan with melted butter. Pour the slightly cooled custard over the bottom sheets and spread to the sides. 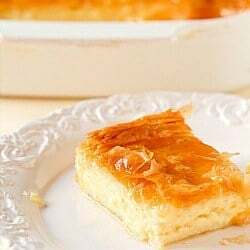 Layer the remaining sheets of phyllo on top of the custard as you did the bottom, continuing to brush melted butter between layers until you have used all the phyllo. Then, brush butter on the overlapping sides and roll the edges down creating a “rim” around the edge of the pan. Liberally brush the top and the edge with the rest of your butter. While the pie is baking, make the syrup. Bring the sugar, water and orange juice to a boil in a small saucepan. Boil for 5 minutes then remove from the heat. Off the heat, stir in the vanilla extract; set aside. When you remove the pie from the oven, let it cool for 15 minutes. Then, pour the syrup evenly over the entire pie. Allow the pie to sit for at least 1 hour before serving so the syrup can be absorbed. Store leftover pie in the refrigerator for up to 3 days.